Officials in Spain's Canary Islands say gusts of wind are hampering efforts to extinguish a forest fire ravaging Gran Canaria island. Fire has burnt at least 3,500 hectares (8,645 acres) of land on Gran Canaria, the third-largest island in the group. Five helicopters and a water-bombing plane are tackling the blazes, along with more than 100 firefighters. Residents have been evacuated from the villages of Ayacata and Mogan. The fire started on Friday. 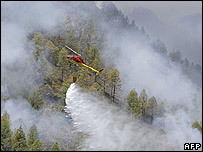 Spanish media say a forestry worker admitted starting the fire because he was facing dismissal. Dozens of people have been evacuated from seven areas since Friday, Spanish television reports. The authorities say a fire on the island of La Gomera has been brought under control.